Arsenal Bowl. Photo by Melanie Linn Gutowski. There’s a lot of past in the present of Pittsburgh’s Lawrenceville, and the two haven’t always commingled peacefully. With a burgeoning spate of new restaurants and shops bringing national attention to the Butler Street corridor, and neighborhood real estate development at an all-time high since the 19th century, it’s easy to forget what made one of the city’s hottest areas so desirable in the first place. The faith of long-time residents, community leaders and local business owners made this happenin’ place really happen. These establishments are a link between the old Lawrenceville and its rebirth as a bustling and popular area. Here are six businesses that have not only survived but thrived through it all. Nied’s Hotel. Photo by Melanie Linn Gutowski. Many of the businesses in Lawrenceville had an influence on its resurgence simply by staying when others were leaving. But not many can say they had as direct an impact on the course of the neighborhood as Jim Nied. He’s the fourth generation of a family who has always owned taverns, going back to his great-grandfather in Homestead. Nied’s grandfather, Ted, opened Nied’s Hotel in 1941. Yes, Nied’s Hotel really is a hotel. “I call it a rooming house,” Nied says. 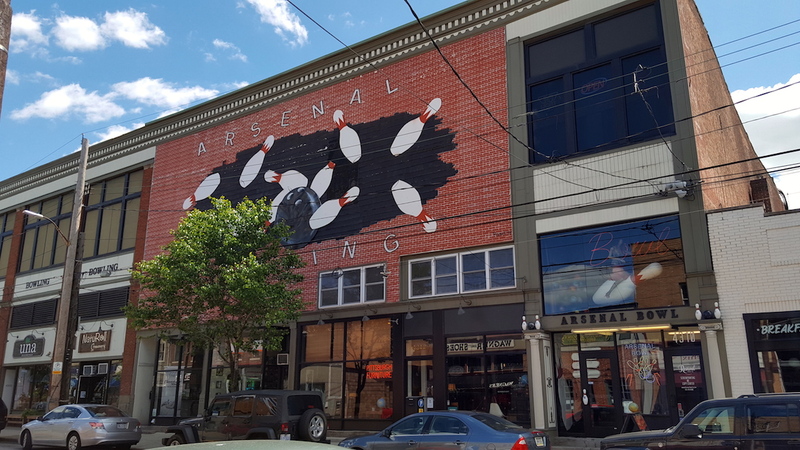 “We have a hotel liquor license and can rent rooms by the day or week, but we’ve never let it out as a regular hotel.” The upper floors of the building are occupied by several long-term tenants, Nied included. 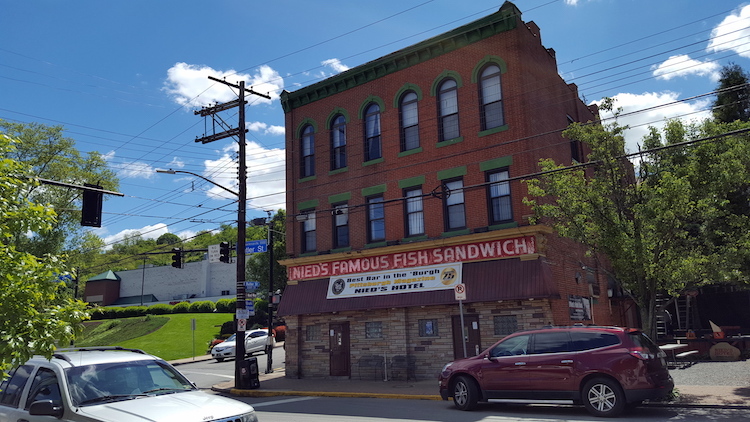 Nied’s is renowned for its fish sandwiches and live entertainment, including its namesake, the Nied’s Hotel Band. In warmer weather, bands play free live concerts on a stage outside the bar, a practice Nied plans to continue, though he’s not afraid to embrace new ideas for entertainment, a recent one being “bluegrass meets bellydancing” with country and Middle Eastern music. Nied credits his own business success to a tried and true fact: “We’re not hip and happening,” he laughs. “I don’t see anything changing.” Though self-deprecating, Nied has been embraced by the newer neighborhood watering holes. He recently was a guest bartender at Spirit as part of a community garden space fundraiser. Walking into O’Bannon Oriental Carpets is a sensory experience. The colors, patterns and scents of hand-woven carpets will make you feel like you’ve stepped into a Middle Eastern bazaar. That’s because owner Kristen Rockwell actually visits Turkey, Iran, Nepal and other countries to personally source her store’s wares. Rockwell, who studied fiber arts at Carnegie Mellon, is the third owner of O’Bannon Oriental Carpets. “I have always had a love of textiles, but never dreamed it would lead me to owning an Oriental rug store,” she says. The business has been around for close to 40 years, the past 10 in Lawrenceville. Rockwell moved the shop from its original location in Squirrel Hill because it wasn’t in a true business district. However, she nearly didn’t wind up in Lawrenceville at all. “It was a colorful place,” Rockwell says of the neighborhood in 2004. “It was still raw. I needed to move the shop and so I spent a year searching for a new location.” Finally, a chance delivery to a client in the Blackbird Lofts led Rockwell to her current storefront, then in rough shape. Though the hand-woven carpet industry itself is in uncertain times due to economic and diplomatic influences, Rockwell is thankful for the support for small businesses she has found in Lawrenceville. 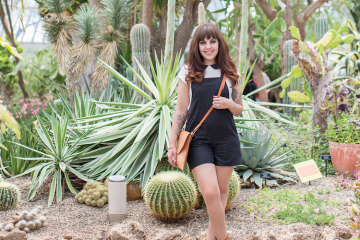 In particular, she credits the support she’s received from fellow women business owners past and present. “Old Lawrenceville is still here and I think that’s a presence that we need to thank, too,” she says. Hambone’s Pub has been a bustling presence in central Lawrenceville for 28 years. With a robust regular schedule of events including open mic nights for live music and comedy, pub trivia and obscure board games, it’s a bar and restaurant with more of the communal atmosphere of a traditional English pub. Wagner Quality Shoes. Photo by Melanie Linn Gutowski. While most of the businesses on this list would qualify as “old school,” none can hold up to the “old” part better than Wagner Quality Shoes. Founded in 1854, the company is only 10 years younger than neighboring Allegheny Cemetery. The original store was in Sharpsburg, just across the river from Lawrenceville. That store closed in the early 2000s in favor of expanding into other concept stores around the greater Pittsburgh area. 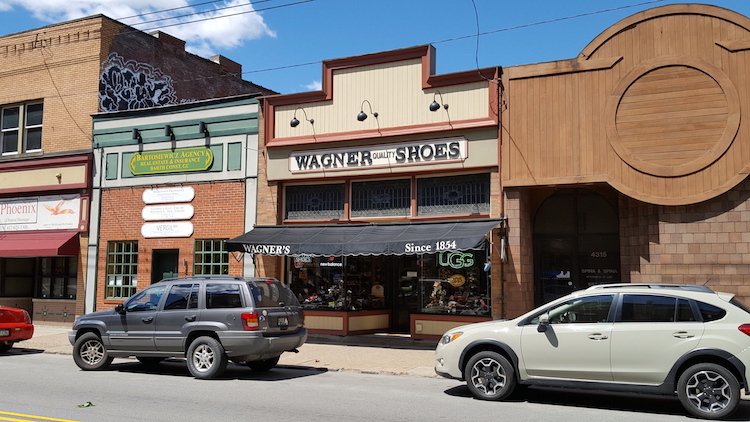 Wagner has been at its current address for more than 80 years. The store’s selection hasn’t changed much—they will always carry the specialty brands they’re known for, according to Wagner—but it has grown. “We’re adding new things, trendier things we can put in the window,” he says.